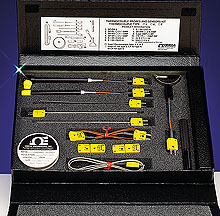 Attache style case is compact, and provides a convenient means of taking thermocouples to the field. Rugged carrying case design features an extra large area for a handheld thermometer, in addition to space for extra wire and accessories. The high impact plastic case has a secure snap lock, and a built-in carrying handle.